With the rise to prominence of Great Yarmouth as a seaside town in the second half of the 19th Century, a large new suburb grew up to the north on what had been until then empty denes. Inevitably, it was called Newtown, and existed to serve the holiday industry rather than the port and the fishing fleet, whose workers lived mostly to the south of the town centre and across the river in Southtown and Cobholm. Despite what are largely rows of terraced houses, this fact gives Newtown a certain genteel air, and there is a sense of its own identity which is largely a result of its separation from the town centre by the vast cemetery. Three long straight roads connect Newtown with the rest of Yarmouth, one of which takes the main London road through to Caister to the north. Just off of this sits St Paul. The church was built as a temporary structure in the late 1890s as one of two chapels of ease to St Nicholas on the market place, and it has has a barn-like feel with half-timbered details. It's near identical twin, St Luke across the river on Cobholm Island, was destroyed by the blitz and the 1953 floods, and was rebuilt in 1960. The architects were the local firm of Bottle & Olley, and the cost was a thousand pounds, about a hundred thousand in today's money, which seems a bargain. The church was extended just before the First World War with the addition of a south aisle, presumably to increase capacity rather from any liturgical need. You step inside to an interior which is very much of its two decades, the nave and chancel separated under heavy timbered roofs with an Arts and Crafts feel, the later aisle rather more functional. 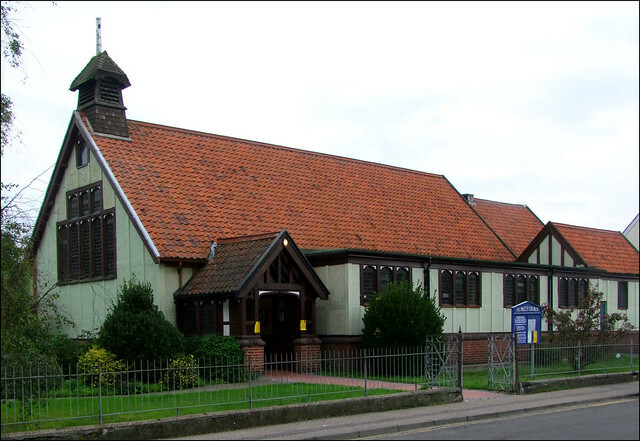 In the 1990s, the church underwent a considerable reordering. The south aisle was screened off with glass, the 19th century pews in the nave were removed, and a hexagonal sanctuary and altar were placed sideways against the north wall, with arcs of blue chairs facing them. Beyond, the integrity of the 19th Century chancel has been kept, for use as a chapel. The juxtaposition is inevitably slightly awkward, as these things always are, but it is done well enough, and benefits from the quality of the materials used. All too often such an arrangement can seem temporary, but here there is a sense of gravitas and attention to detail. The 19th Century font is still in use at the west end, and the former north doorway leads through to a fine parish hall. All in all, the reordered St Paul successfully demonstrates a sense of community, and the energy which drives that community forward. I said earlier that this church was built as a temporary structure. When the nice people on duty found out who I was, they made sure I knew that plans had been drawn up in the 1930s for a more impressive and permanent structure, and money had been set aside for it. But the Second World War intervened, and after the blitz destroyed the mother church of St Nicholas all the funding went on the rebuilding there instead, and St Paul was left as it was. I'm not saying they were cross about this; they weren't spitting feathers, or anything. But they wanted me to know, and so I took this also as a sign of the community's independence and continuity.